Hanging over the porch of the tiny New England bookstore called Islry Book Is a World.” A.J. Fikry, the irascible owner, is about to discover just what that truly means. A.J. Fikry’s life is not at all what he expected it to be. His wife has died, his bookstore is experiencing the worst sales in its history, and now his prized possession, a rare collection of Poe poems, has been stolen. Even the books in hiand Books is a faded sign with the motto “No Man Is an Island; Eves store have stopped holding pleasure for him. These days, A.J. can only see them as a sign of a world that is changing too rapidly. And then a mysterious package appears at the bookstore. It’s a small package, but large in weight. It’s that unexpected arrival that gives A.J. the opportunity to make his life over, the ability to see everything anew. It doesn’t take long for the locals to notice the change overcoming him or for a determined sales rep named Amelia to see her curmudgeonly client in a new light. The wisdom of all those books again become the lifeblood of A.J.’s world and everything twists into a version of his life that he didn’t see coming. I found it so eerie when I came across that quote when reading this novel because those were my exact thoughts at that almost exact moment regarding this novel. Have you ever come across a book that spoke to you at a higher level? As if you were meant to read that book at that particular time in your life? The Storied Life of A.J. 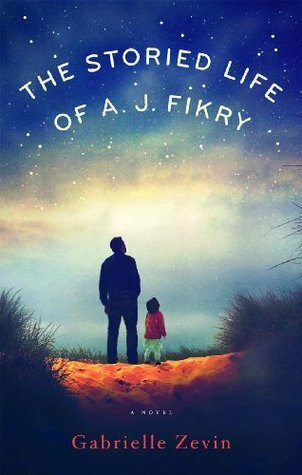 Fikry was that book for me; However, I didn't know that until about halfway through and certain of it once I finished the last page. Despite my first introduction with A.J. Fikry: Grumpy and very set in his ways at his "ripe" age of 39 years old, I couldn't help but love him. Maybe it's because I had the feeling that he would soften and redeem himself throughout the book, but either way I liked him immediately. I pictured him distinguished and a cardigan wearing man, however the author swiftly nixed that image as soon as she introduced his converse wearing style. On that note, I would love to discuss the authors beautiful character and world building. I could almost smell the mustiness of Island Books, and the crisp sea air of Alice Island. She introduced her characters so delicately. Almost as if, at any moment that character could be whisked away...Does that make sense? What I mean is, she doesn't jam a character in your face, with unnecessary details, trying to get you to like him or her right off the bat. She introduced each one gently, so we could develop our own sense of this character. And decide for ourselves if we will like him or her. I feel in love with Maya immediately, and if you didn't, than you are made of stone! She is by far, one of my favourite "Child" characters. I use child in quotes because she is very clearly, an old soul. And quite obviously is meant for A.J.. That is very clear. Amelia is another wonderful character. A spunky personality that I clicked with right away. Despite her having my dream job(and I'm sure the dream job of all us Book Bloggers): A sales rep for a publishing company. Her fashion, personality and characteristics reminded me of myself. Loved her! The most lovely thing about this book is it's characters. Each one. The main characters, the secondary characters, even the Pirate Waiter at Pequod's. This book doesn't have a vampires or love at first romance. It doesn't have paranormal activity or a Dystopian page in it's body. It is a simple story that will have you absolutely enthralled. It may be short in pages, but the story will have you devouring the book and thinking about it long after you read it! A.J. Fikry, Maya, Amelia, Ismay, Lambiase...Thank you, friends! It has been a pleasure! tiffany bracelet sale He doubts, tiffany uk sale because he really do not understand this is a kind of person. It's tiffany bracelet sale that simple. Aguang there doubts. If you want to cure your disease, you mix it http://www.intra-mark.co.uk with me, maybe I can help you find a method of treatment, or else you Aguang suddenly feel this tiffany bracelet sale is tiffany uk sale not in the teasing of their own, but a sense of humor. as a springboard, then we can ray ban sunglasses outlet australia easily control the Sanjiang province. cheap ray ban sunglasses australia three decades east west three years, ray ban sunglasses sale australia I sooner or later take him underfoot. I really imagined the feeling of standing on the peak, but it is still a long road, the first cheap ray ban sunglasses australia River City is a hard row to hoe, cheap ray ban sunglasses australia only the cheap ray ban sunglasses australia fist is the real final say, underground emperor and how, if we control the jiangzhou. Replica GUCCI handbags for if you will buy those which are labeled as real ones, you will have to pay the premium for the name of the supposed “genuine” bag that you will buy.